1. Rinse the crabs well and halve them. 2. Crack the claws and keep aside. 3. Heat oil in a pan over high flame. 4. Add the garlic and black pepper. Stir-fry for 30 seconds. 5. Add the crabs and cook for 2 minutes. 6. Sprinkle sugar and salt. 7. Pour the chicken stock and cover the pan with a lid. 8. Simmer for 5 minutes and towards the end, add the spring onions. 9. Stir well and remove the pan from heat. 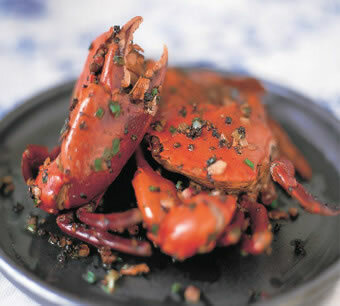 Feel free to comment or share your thoughts on this Black Pepper Sauce Crabs Recipe from Awesome Cuisine.